Fuzeta ist a small non commercialised traditional Portuguese fishing village, with a little more than 2000 inhabitants. Fuzeta has refused the mass tourism, so you will not find any Discos, Hotels ore Golf courses. The houses are square and whitewashed, with flat roof terraces, where the fishers still dry some species of fishes. The Village has a great charm with the local market, the Central Square, and wonderful unspoiled views. There are several typical restaurants, where you have a great offer of fresh fishes and Seafood. In Fuzeta you find also a big offer of Bars near the Sea with some night life during the summer. Lying on the limits of the most important sanctuary of wildlife in the Algarve, it is the prefect place to walk in the companion of various Birds, like the flamingos, Storks or the purple gallinule. You may also discover the natural reserve by boat with one of the local fishers. It is also know for having the ideal location for practice of watersports. The Flat Ria Formosa is located in the small Fisher village „Fuzeta”, also known as “Branca Noiva do Mar”, white bride from the Sea. 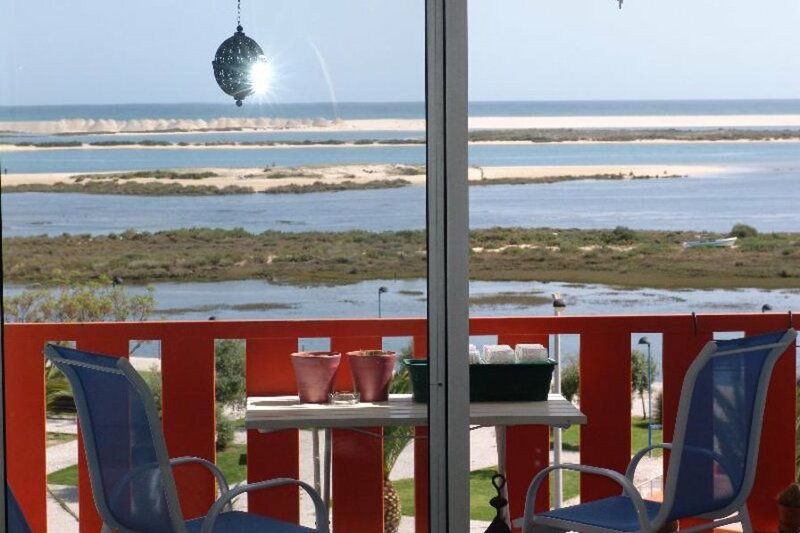 This Apartment is located in the ocean front line, on the 4th floor, and has a stunning view over the Atlantic, the Natural Park Ria Formosa, and over the Armona Island. Due to a special agreement all the guest from Casa de Campo have 50% discount in the rental of 1 Sunshade and 2 Sun beds in the beach club GUENAN on the Armona Island (Fuzeta) .